Introducing our Emmett Team for this year! 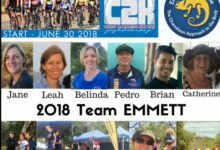 Let me introduce you to our amazing team of Emmett Technique therapists for this year’s 2018 C2K Ride. As with previous rides we’ll be available to provide treatments assisting you throughout the day from breakfast to dinner for a $$ note donation (All proceeds are donated to the C2K.). If you have any pain or discomfort, please shout out to us and we’ll greatly reduce your pain within 5-10 minutes. It’s quick, painless and effective. Emmett can be given sitting, standing roadside at drink stops, at lunch, dinner even standing at the bar waiting for a drink. Wherever you need us, we’ll be there for you. Each night we’ll set up a base camp where our massage tables will be popped up and chairs set out ready to ease your aches, ouchy bits and tired muscles. Just look out for our marquees with the big yellow Emmett Flag flying above. Emmett Therapists are a noisy happy bunch so follow the laughter. The treatments are fast and effective, so we’ll be able to see as many riders and supporters as we can. The waiting room is set out each day, so bring your beverage, take a seat on our comfy camp chairs and yarn to the other riders about your beaut day of cycling while you wait for your treatment. We’re super excited to tag along on the C2K again for the third year. Can’t wait to meet you, the riders, supporters & volunteers and to introduce you to our passion, “The Emmett Technique” and take away any pain or discomfort you develop along the way. It’s a huge ride and we are here for your all. For those of you who haven’t heard of Emmett Technique I’ve popped a link here of our testimonial video we filmed on the 2016 C2K ride. Your ticket for the: Introducing our Emmett Team for this year!